Stanley E. Patterson, PhD, is chair and associate professor of the Christian Ministry Department, Andrews University Seventh-day Adventist Theological Seminary, Berrien Springs, Michigan, United States. During the fall of 2009, I attended a morning chapel service at the Seventh-day Adventist Theological Seminary in Berrien Springs, Michigan, and noticed the printed program included no preacher. Just music—good music mixed with an occasional scripture reading and short testimonies. The singing included hymns and praise songs that focused on the power, love, and majesty of God. I love preaching and I love to preach, but on this day it did not happen—just music, testimony, and the Word. In this simple context, I found myself drawn in a powerful way into a personal encounter with my God. I did not go into the service expecting revival, nor did I fully under­stand why it happened even though I have been a Christian for many years. I have served as a pastor, local conference leader and administrator, and now as a seminary professor only a few years from retirement, and found myself overwhelmed with a sense of God’s presence and my need for renewal of my relationship with Him. So it was that in the silence of a couple hundred voices joined in praise and hymns, I recommitted my heart and life while trying to keep my tears to myself. I wish to be clear regarding the purpose of writing this recollection. It is not to extol the advantages of the simple service or the value of the absence of preaching as a method. I want to share my 37-year journey and struggle to maintain an authentic biblical spirituality. What happened during the 50 minutes that I sang and prayed and listened? There was no touching appeal from a skilled preacher nor was there a prophetic call or encounter with truth that gripped me with a knowledge of my sinfulness—just music, testimonies, and the Word. Or was it? Might it be that the declaration of Jesus regarding true worshipers in John 4 found resonance in my soul on that fall morning? Spirit and Truth! I believe that the Spirit part of that description discovered me that day through a group of seminary students minister­ing in song, testimony, and the Word. It was not merely a cognitive experi­ence of Truth. The Holy Spirit pressed upon me and became more than a subject I study or a title I invoke at a marriage or baptism. The Spirit was the presence of God ministering to me that day and reminding me of the essential element of spirituality that must daily drive me forward even as Jesus was cast (Mark 1:12) by that same presence into the wilderness as He began His ministry. 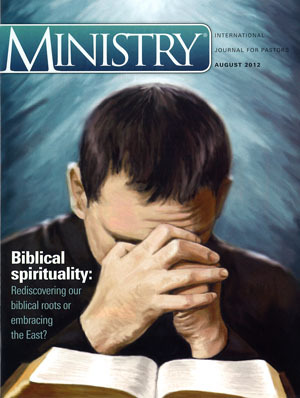 The Christian life and professional ministry, in particular, require motiva­tion. For years, I served the church as a member of a small team that sought out the best people to serve as pastors in the churches we served. I am shamed at the memory of how many times I repeated the quality self-starter as a dimension we desired in a spiritual leader. How can one be a self-starter and qualify as spiritual? Self for me is what has always gotten in the way. Actually, the motivation of the Spirit presses me forward from my bed to effective ministry each day as I lead in the name of Jesus. This has nothing to do with self. That same deep and almost visceral stir­ring that separated me from another vocation to follow the call of ministry is the internal motivation that has propelled me on through a lifetime of service that would have otherwise worn and crushed my spirit with the weight it brings. My renewal experience on that fall day in the seminary chapel was not, I must admit, the first renewal I have experienced in my 37 years of professional ministry. The temptation to lean on the arm of flesh seems like a siren’s song that constantly beck­oned me away from the Spirit as my strength. The wonder of it all is that same Spirit keeps calling me back to the foundation upon which pastoral ministry is built—a deep and abiding spiritual relationship with God. A necessary discipline exists in the life of every Christian and is critically important in the life and leadership of the pastor. The follow­ing quote highlights this discipline in the life and ministry of Jesus: “Christ knew that He must strengthen His humanity by prayer. In order to be a blessing to men, He must commune with God, pleading for energy, per­severance, and steadfastness. Thus He showed His disciples where His strength lay. Without this daily com­munion with God, no human being can gain power for service.”1 The model of Jesus as a “daily” practice has been a challenge for me as agendas and responsibilities so eas­ily provided an excuse to pursue the urgent and neglect the necessary. The nurture to sustain spiritual power can be accessed only through rela­tional discourse with the Source of spiritual power. My spiritual renewal on that fall day placed a craving in my heart to cling to that experience and provided an internal motivation to strengthen my commitment to that daily discipline—not to please someone else or meet someone else’s expectations but to protect that powerful sense of the presence of God I experienced that morning. My inner self has always resisted the maintenance of my spiritual life even as Paul the apostle confessed his struggle to do what he knew to be best and right. “The law is spiritual, but I am carnal” (Rom. 7:14, NKJV). So the internal force to resist the Spirit is and has been my primary challenge to live and lead in a spiritual manner. But there have also been external forces present in my life that reflection has revealed as having a negative impact on my efforts to embrace the Spirit as my motivating force. Especially as a young pastor, I, too, often focused on meeting the expecta­tions imposed upon me by others. My efforts to find acceptance from those in authority over me by doing more, accomplishing more, and being successful muffled the voice of the Spirit in my life as I reached competitively for numerical goals and embraced the creative products of others to be seen as successful. A discussion of this subject requires me to confess that those who direct and support the work of the pastor have a role to play in sus­taining the spirituality of the pastor as the primary driving force in his or her life and service. I served that role and was entrusted with the steward­ship of pastors and their families for nearly half of my years in ministry. At this point in my life, I find myself asking what I did to strengthen the discipline of biblical spirituality in the life of the pastors whose care I was charged with. I think of all the fresh-faced, energized young leaders who came into ministry under my watch—short on experience but with hearts full of commitment to serve God and His people in a manner that would grow His kingdom. Are they still energized? Are they still propelled from bed each morn­ing by the Spirit with a heart and mind committed to the goals that brightened their eyes as interns? Did I pressure them through a command and control approach that turned their eyes and ears from the Spirit who had promised to work His will in and through them? The world has influenced our leadership behaviors, and I fear that unwittingly some of us have not always supported the nourishing of that internal Spirit that makes the pas­tor a spiritual leader. How many times have we, as leaders, contributed encouragement through external or extrinsic rewards as a means of boosting “productivity” in pastors? The quantitative valuing of pastors by celebrating numerical success in a way that compares each with his or her colleagues leads to the adoption of competitive behavior that dampens spiritual motivation. In adopting a business or sales model in the context of spiritual ministry, we risk replacing the Spirit-driven model introduced at Pentecost with a management model replete with the necessary coercive structures (rewards and punishments) that are familiar in the corporate and commercial world. The church was designed to function on a relational model, wherein each child of God was to be gifted for ministry com­petency (Rom. 12:4–6; 1 Cor.12:1ff; Eph. 4:7–13), transformed to bear fruit by the Holy Spirit (Gal. 5:22, 23), and motivated and empowered by the indwelling Spirit of God (John 14:17; Acts 19:1ff; Eph. 3:20) to accomplish His will. The church is not a business! The tendency that has emerged in the latter part of the twentieth century to refer to pastors as employ­ees has tempted us to treat them as such. The managing of the pastor as though he or she was a salesperson with quotas creates the “hireling” (John 10:12) of whom Jesus warned us. When treated and related to as an employee, the natural progression is for the “employee” to migrate toward transactional behavior­ minimal contribution, marginal commitment, and low creativity. Contribution and commitment are replaced with compliance in the race to satisfy the expectations of others. For this reason, the “hireling” will not die for the sheep because there is no sense of ownership to spark commitment. The Good Shepherd dies for the sheep because they are His (John 10:11)! When we objectify the pastor as an employee, we strip the ownership element away. It seems to me that we have forgotten that the pastor is paid subsistence for spiritual leadership service rather than remuneration from the church to fulfill a trans­actional commitment. The pastor doesn’t work for money—the pastor is given money so he can work! When the pastoral salary is extended as payment for services, we encour­age the hireling mentality that limits the risk and dedication the pastor owes to the high calling of gospel ministry. The fostering of a manage­ment relationship between pastor and church organization unintention­ally contributes to the suffocation of the Spirit as a motivating influence on pastoral effectiveness. The management of pastors often involves the organization’s effort to do for the pastor what the Spirit has promised to do through the pastor. The pastor’s creativity is replaced by the creative product of experts who plan and devise means of ministry for the pastor. This has a choking effect on the spirituality of the leader. Often the pastor’s schedule or agenda will be so filled with work created for him or her to carry out that there is little time left for local creativity. We must remember that the authority offered by Jesus (Matt. 28:18–20) is distributed at the member level where the pastor serves. This is not the sole possession of positional leaders who would think to know best what the pastor or church needs. The word authority expects the one holding it to “author” or create in a generative manner. The nurturing and honoring of the Spirit of God in my life is essential, as it is in the life and work of every pastor. We cannot lead in a direction that will accomplish God’s will on this planet if we apply methods and means that sidestep the Holy Spirit. My own renewal and maintenance of the gift of biblical spirituality that is my inheritance as a child of God is my primary responsibility. The honoring and nurturing of the work of the Holy Spirit in the life of those I serve in this church comprises the most important work I have before me. I am called to make disciples who will become the spiritual leaders of our faith community. It would be nice if I could awaken some fine morning and discover that the work of the Spirit was no longer resisted by the internal force of my fallen nature. It would be a relief on that day to know that every external force that encourages me to turn to the expediency of the arm of flesh had disappeared from my life’s con­text. But both such wishes are not apt to find a place in my reality. Nurturing my spirituality is likely a task that will occupy me for the rest of my life. Should I be discouraged by that prospect? I think not. The Spirit that unexpectedly shook me from my reverie of self on that fall morning in 2009 will likely have to shake me awake again. For that I give my God thanks. Praise Him for His vigilance in reminding me of my need for Him! “If we [I] live in the Spirit, let us [me] also walk in the Spirit” (Gal. 5:25, NKJV). 1 Ellen G. White, Counsels to Parents, Teachers, and Students (Mountain View, CA: Pacific Press Pub. Assn., 1943), 423. 2 White, Christian Leadership (Washington, DC: The White Estate, 1985), 43. 3 White, Testimonies to Ministers and Gospel Workers (Mountain View, CA: Pacific Press Pub. Assn., 1923), 303.